Hangar One is a historical place. It is spread in 8 acres. Hangar One is the world's largest freestanding structure. It was built in the year 1930. It is the one of the famous landmark of callifornia. For the USS Macon it was a naval airship hangar. German air ship designed it and Engineer Dr. Karl Arnstein structured it . The doors orange peel were having weight 180 metric tons. They were moved by 150 horsepower motors. In the year 1965 it was nominated as a US Navy Historic Site.By the Navy Chief of Naval Operations it was awarded as Naval Historical Monument in 1966.The Navy ultimately decided to retain the hangar. 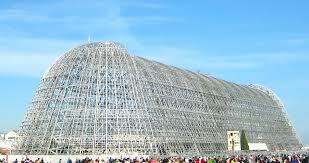 For restoration of Hangar One the $32.8 million were passed in year 2012. But yet no any action is taken. By the San Francisco section It has been designated a California Historic Civil Engineering Landmark. The Air and Space West Educational Foundation also want to the museum here.They understand the historic importance of the building very well.So they decide it and give the proposal.